If you’re anything like me, you’re already filling your fridge with fresh raspberries and dreaming of fabulous recipes to make with them. Am I right? 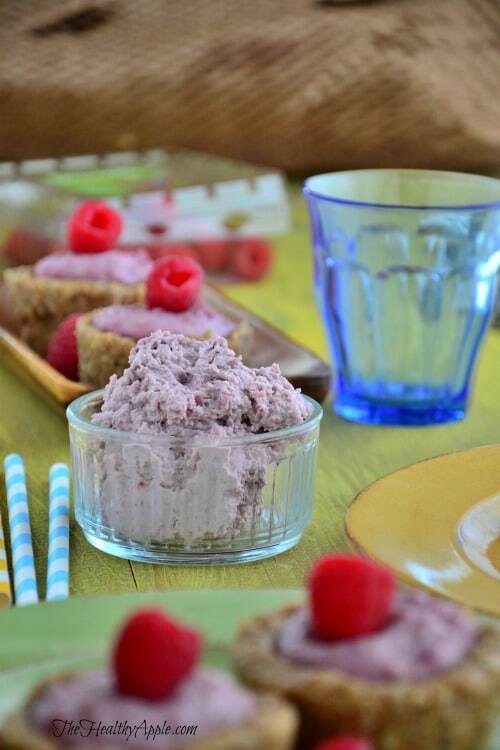 Today I’m sharing a healthy raspberry dessert recipe that I created with Driscoll’s organic raspberries because I simply can’t get enough of these beaming beauties. 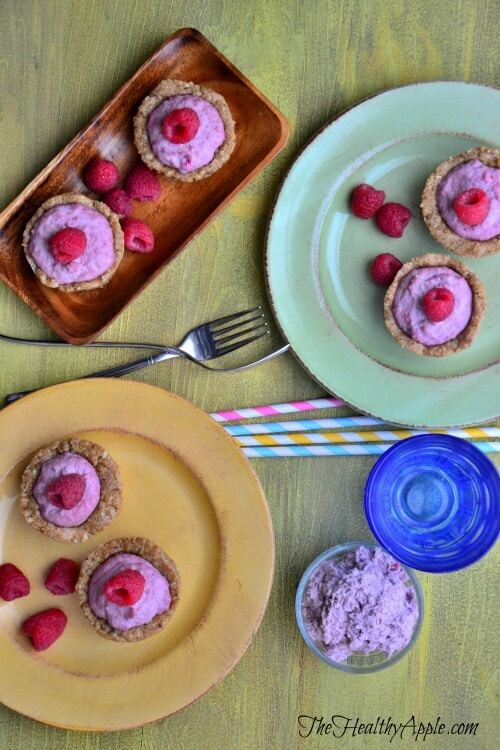 They’re what make this dessert spectacular so you’ll want to whip up these tarts this week. Whether you’re planning to entertain this weekend or just relax at home and soak up the sunshine with a glass of fresh lemonade, you can prep these tarts in the morning, place them in your fridge until set, and serve them chilled for an afternoon or evening sweet summer treat in place of your popsicle or ice cream. Since I was a kid, I’ve always loved raspberries. There’s something about these pretty pink berries that makes dessert so special. They remind me of rubies; they’re so delicate and naturally sweet and you can enjoy them by the handful or tossed into a simple dessert, like the one I’m sharing with you today! All you need to do is gather your favorite raw nuts and whirl them around in your food processor with sea salt, cinnamon and dates until the mixture forms a dough. Then, mold your dough into cupcake tin cavities and set in the fridge to chill while you soak raw cashews in a large bowl filled with water for at least 3 hours. It’s very important to soak the cashews for at least 3 hours or the filling won’t be creamy; it will be gritty. And then you won’t be a happy camper, so trust me on this. Soak those cashews, folks! 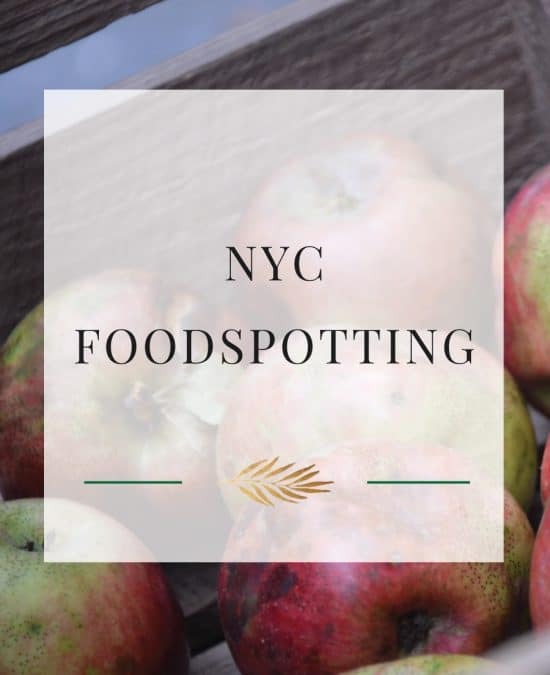 Once the cashews are soaked, rinse and drain them with cold water and add them to your food processor with almond milk, lime zest, lime juice, pure maple syrup, coconut oil, sea salt and raspberries. This is the ‘cheesecake’ filling for your tarts; it will get nice and creamy and you’ll want to dip your finger into this about 10 times to taste it. Then, all you need to do is scoop this ‘cheesecake’ filling into the cupcake cavities and place the tarts in the fridge until they’re set, about 6 hours. Then, when you are ready to serve, top the tarts with fresh, whole raspberries and you’re good to go. This cheesecake recipe is SO much better than the real thing. 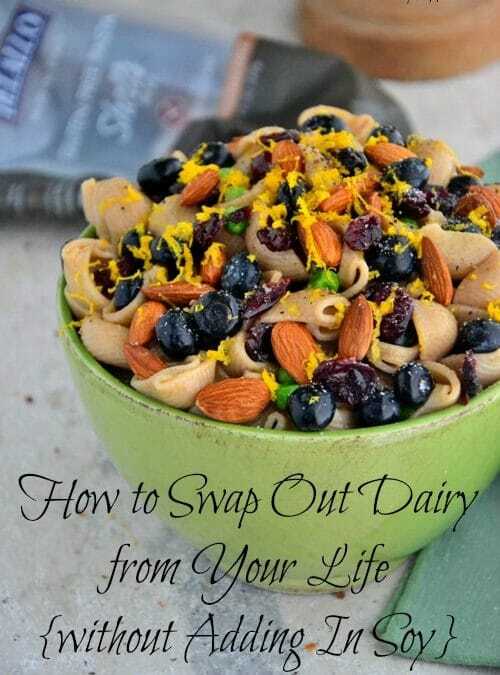 There’s no dairy in this recipe- so you won’t find any cream cheese or any other processed ingredients. There’s also no gluten, soy or refined-sugar! 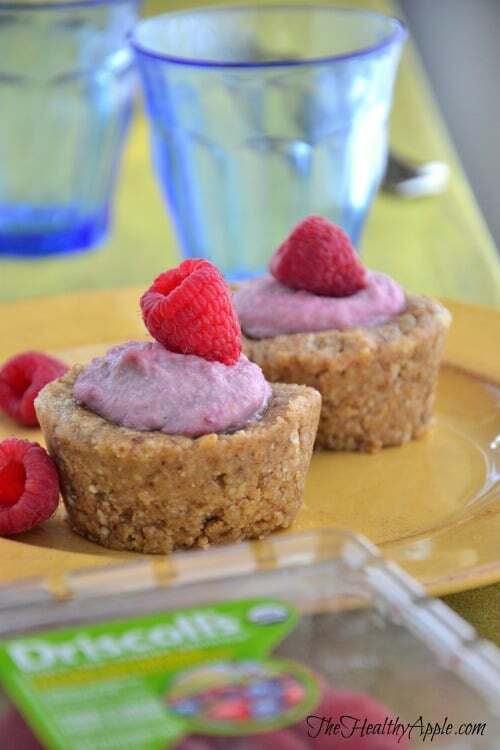 These tarts are made from whole, organic ingredients that your body can identify, absorb and enjoy – unlike the real thing (a.k.a. New York Cheesecake), which is filled with processed ingredients. 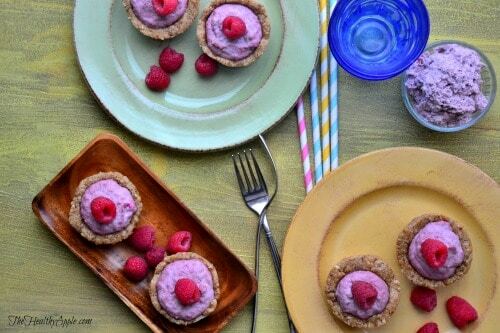 You can feel good about diving into these tarts and enjoying the extra cheesecake filling with fresh berries, on top of ice cream or with coconut milk yogurt too! 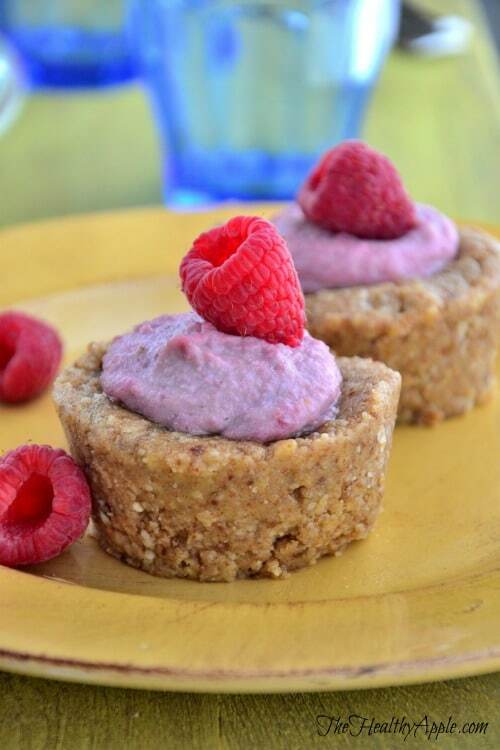 Now, you have an excuse to eat a fun (and healthy) raspberry dessert this summer. Soak the nuts for at least 3 hours in a large bowl covered with water on the counter top. Set aside. Coat the cavities of a 12-cavity muffin tin with coconut oil; set aside. In a food processor, blend the nuts, sea salt, cinnamon and dates until mixture forms a dough. Scrape down the sides every few minutes. Divide the mixture into the prepared cupcake cavities and use your fingers to mold the mixture into the cavity to form the crust on the bottom and up the sides. Transfer to the fridge. Drain and rinse the soaked cashews. Pat them dry with a cloth and transfer to a food processor. Add almond milk and puree until smooth. Add lime zest, lime juice, raspberries, pure maple syrup, coconut oil and sea salt. Puree again until smooth and well combined. Remove crusts from the fridge. Spoon mixture into the refrigerated crusts and fill to the top. You will have some leftover filling that you can store in the fridge in a sealed container. Transfer back to the fridge to chill for at least 6 hours or until ready to serve. 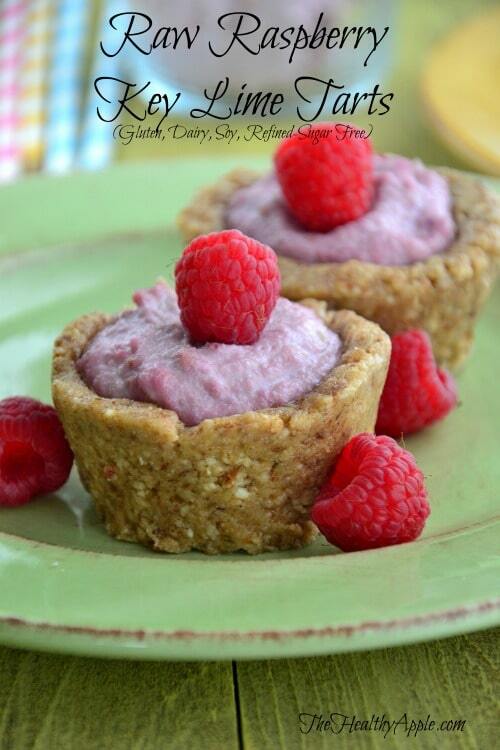 Before serving, remove from fridge and top the tarts with 1 cup fresh raspberries. Serve chilled. Note: Serve any leftover cheesecake filling over coconut milk yogurt, fresh fruit or coconut ice cream. 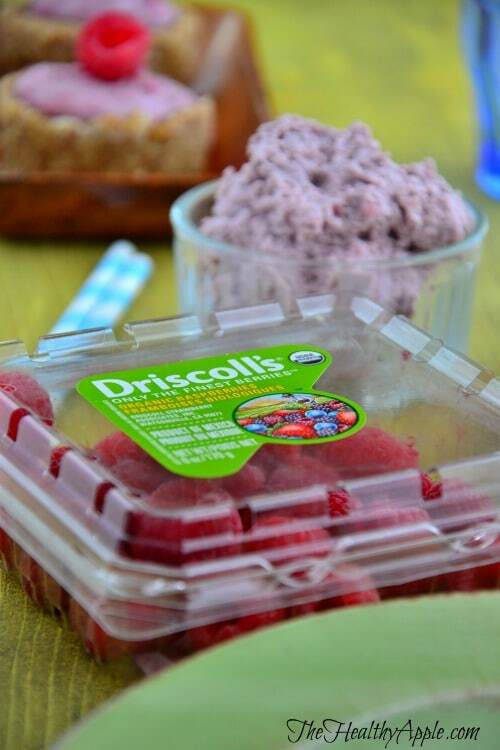 Paid Endorsement from Driscoll’s – Visit Driscolls.com for more berry recipes. This recupe sounds AMAZING!!! Just have a question, is there any other good option of oil (fat) to use instead of coconut oil? For some reason I cannot stand the flavor of sweet coconut in any of its forms! Salty, sour, or spicy it’s perfectly fine, but sweet… Thanks! Awe; thank YOU Juliet. xooxox Hugs from NYC!!!! These look wonderful, and I feel like I can already taste their nuttiness before ever having made them! Mmmm. Is your food plan diabetic friendly? I was just diagnosed with elevated blood sugar (pre-diabetic) and would like to get it under control before it becomes full blown.